The hilly country north of Dunkeld is dotted with small lochans - scenic stretches of blue water concealed by craggy tops and tranquil mixed forestry. Popular with fishermen, they they make great rest stops for walkers and mountainbikers exploring the area. Cally Loch is the first you encounter. It's just a short distance from the car park and is so well hidden by trees you could easily miss it. 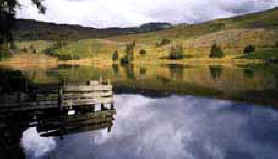 Mill Dam, Rotmell Loch and Dowally Loch follow in close succession higher up and a couple of miles on you come to Loch Ordie with its quaint fishing lodge. The next stretch is altogether more remote with a long section over open moorland to Loch Oisinneach Mor. It's little sister, Loch Oisinneach Beag is not far on. From there, the route turns south and there's a great wee bothy to visit just a mile up the hill. The tiny tin shack is ideal for a quick pit-stop or you could spend the night there - it has beds, chairs, and a stove. All the comforts of home, miles from anywhere! This route is easily contained within a day if you're using a mountainbike. For those on foot, it can be split into two easy days with an overnight stop at Sarah's Bothy. 1. Leave the car park and follow the access track down to the first junction by a big yellow sign for Atholl Estates. Turn left here and hit a low gear straight away as the road rises steadily for the first hundred yards or so. 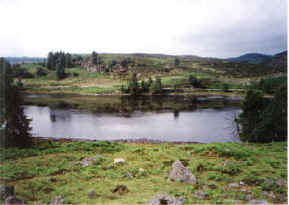 Cally Loch is down to the right and on the left there's a small cottage. Go straight on and the track rises and falls gently through woodland. The first real uphill stint starts as you pass the house at Hatton. A long drawn out climb takes you back into trees beyond a cattlegrid and the road curves right and loops up round Birkenburn before a welcome descent zooms down over open land. You may see deer here. There's a little more climbing before a high gate close to cottages at The Glack is reached. 2. Go through the gate (it's not locked) and follow the track up to Mill Dam, the second lochan of the day. 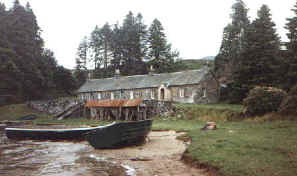 The main track heads along the left side of the water, passing a large wooden boatshed. Follow this and, at the next junction of tracks, bear right and Rotmell Loch is soon reached. The water here comes right up to the edge of the track which runs flat for a way before rising over the crest to Dowally Loch. Continue to Raor Lodge, just beyond another high unlocked gate. 3. At the track junction next to the house, turn right and the way runs alongside a burn on the left. It climbs to a low metal gate a short way on, before curving right through sheep grazing land, the stream still close by. There's more ascent, before the track drops to cross a tiny stone bridge 500 yards short of Loch Ordie. 4. Follow the track straight on along the west shore of the loch and at the top corner it curves left at a junction with a path which branches off to the right to cross a stone bridge. Follow the track north for half a mile to another junction. 5. Don't go left here on the main track, but carry straight on, crossing a another small stone bridge. The route passes through a low wooden gate and curves north, woodland on the left. Look out for deer lurking in the conifers. Cycling can be hard work on this section as the track is badly rutted and fairly muddy. Continue to another gate. 6. The way levels off to run through heather and grass. At the next track junction go straight on to the ruin of a remote cottage. Then continue north, curving right to cross a burn and then left. At this point the more obvious track climbs to the right up the hill. However, a less clear grassy path carries straight on, running level around the hillside. Follow this to Lochan Oisinneach Mor. 7. When you reach the water's edge, follow the track clockwise round the loch. There are a couple of pleasant little beaches which make good places to stop and, if the weather's warm, paddle. Just watch out for the pike which are known to swim here! Again the track is muddy but it firms up when you round the top of the loch. Head north east on a good track to Lochan Oisinneach Beag. 8. The track curves round the top of the tiny lochan and turns south for the return leg of the journey. The track climbs and within a few yards there's a high locked gate to negotiate. The stile here makes matters easier. The ascent goes on right up until you reach Sarah's Bothy, a metal and wood shack built next to a clump of pine trees. This is a handy shelter in the rain and its a good place to stop for a quick rest or bite to eat. If you're on foot, you can spend the night here. Otherwise, continue along the track to the next junction. 9. The main track goes right here. But go straight ahead along a grassy route hemmed in by heather, following the burn down to the right. It can be wet initially but soon firms up as you drop to a bridge over the burn. Carry on down, crossing another high gate and stile. The way is narrow due to dense heather but the track is easy to follow. Towards the bottom, it curves right to reach a low locked gate with a stile. Cross and, at the next junction, carry straight on to Loch Ordie. 10. This time the route follows the south shore to Lochordie Lodge. Head along the front of the cottages and the track skirts through shrubbery to join the track leading up from Raor Lodge at a T-junction. Turn left and head down to Raor. 11. When you reach the lodge, turn right, pass through a low gate, and a steep stony track twists down through mixed woodland to a gate at the bottom. This is a great chance to get some speed up if you're on a bike. 12. Go through the gate and turn left. A farm track rises gently through open fields. As it passes behind Rotmell Farm, the incline becomes more strenuous and there are a couple of gates to negotiate as you pass through grazing land before an avenue of tall beech trees leads back up to another plantation. Carry straight on at the next junction and a high unlocked gate marks the start of the next forest. The track, grassy at first, runs level through larch trees before dropping away with some speedy downhill strips. There are two gates to watch out for and walkers are common here too. At the bottom, the track emerges on to tarmac. 13. Turn left and follow the road to Polnie Loch. Pick up a path at the pond along its south shore and, at the end of the water, this rises into woodland to lead back to the car park. WALK FACTS - Distance: 26 miles. Map: OS Landranger 52 or 53. Start/Parking: Cally Car Park, north of Dunkeld (grid ref 024437). To reach it, follow the A923 through Dunkeld. Turn right towards Blairgowrie. Take the second track on the left, signed 'The Glack' and the car park is a short drive on. Grading: Solid track and path over open hillside and moor. Some muddy sections, depending on the weather.